Wow. There is no way I could of gotten that; I'm way too stupid. What do you mean summer vacation is here? "including 23 found in a resident's back yard." 23!? You would think that they would've found those one earlier. Creepy. I would have thought of some kind of fight, but gladiators were not the instant thought. I am very glad I do not live in rome. Why would those people want to fight to their deaths. They could have been forced but Iit says they weren't criminals.They where buried with honor so they probably were not slaves. Maybe there was some kind of reward if you won? My first thought was Romans. Sounds brutal enough to be them. Being in England it's a possible. :) Can't wait to find out! Because of my intelligence, I came up with that immediately. 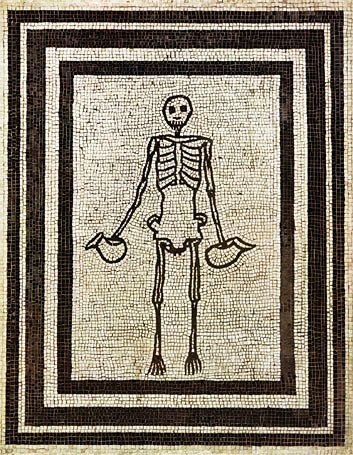 That mosaic is in my Latin textbook. This yearwe're learning about the Roman occupation of Britain. I feel happy. forsenics people are idiotic- even without evidence I know what that is. ooh, cool! imagine some archaeologists digging up your backyard and finding 23 skeletons, the remains of your human predecessors... ooh, that would be wonderfully creepy! i didn't guess gladiators though, even though i'm among the smartest of my grade. that just shows how idiotic some of my classmates are. 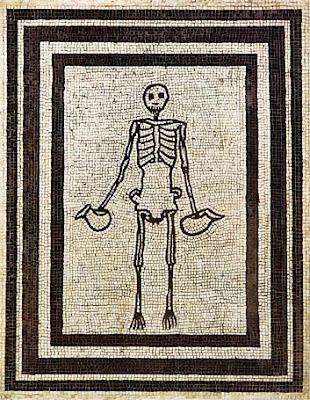 but seriously, i wish i had ancient graves in my backyard! seriously cool! Wow that's really cool!! Why wouldn't they have been buried with their armor though? Because that would've been preserved and it was an honor to be a gladiator so they would've been buried with it, wouldn't they? Hmm. . .
Gladiator graveyard...my dad mentioned this happened. Wierdness abounds. Rileydog: I don't think the Romans were as much into the taking-your-stuff-with-you-to-the-afterlife thing as the Egyptians were. Gold coins on the eyes to pay to cross the Styx, but I think that was it. I guess the Elysium was probably well supplied with whatever you could want, and if you ended up in Tartarus, well, you probably wouldn't be needing much. In other news--SCHOOL IS OUTTTT!!! A little surreal because we had the math final, which I am pleased & a little surprised to report I don't think I failed...Yay! Summer is here!!! Oh--wierd thing of the day: I was walking into the house & out of the corner of my eye I could have *sworn* my mom's blue van was actually a beat-up, old-fashioned green truck. Just for a second, but wierdly realistic.